Towson won one game over UNC Wilmington and dropped another to the College of Charleston this weekend, but they continue to push for a berth in the Colonial Athletic Association (CAA) tournament. Sunday, the Tigers (6-10-1, 3-4-0 CAA) fell to the Cougars (10-6-1, 3-3-1 CAA) 2-1 on senior day at the Tiger Soccer Complex. Towson was on its back foot immediately as redshirt junior goalkeeper Taylor Sebolao could not clear a free kick out of the area, and Charleston defender Raymara Barreto tapped home the rebound. Throughout the first half, the Tigers struggled to hold onto the ball and could not create many chances. The second half started out just as rough as the first, as the Cougars took advantage of a set piece to double their lead. Riley Narum headed a Jessica Schifer cross past Sebolao and into the net. After the goal, the Tigers started to hold onto the ball and create more chances. The team eventually pulled within a goal 83 minutes in. Senior midfielder Marissa Green got on the end of an Emily Marshall cross on a corner and headed the ball into the net from 15 yards out. Friday, the Tigers picked up their first home win over the Seahawks (8-4-3, 2-2-2 CAA) since 1994 and their first win overall versus the Seahawks since 2011. 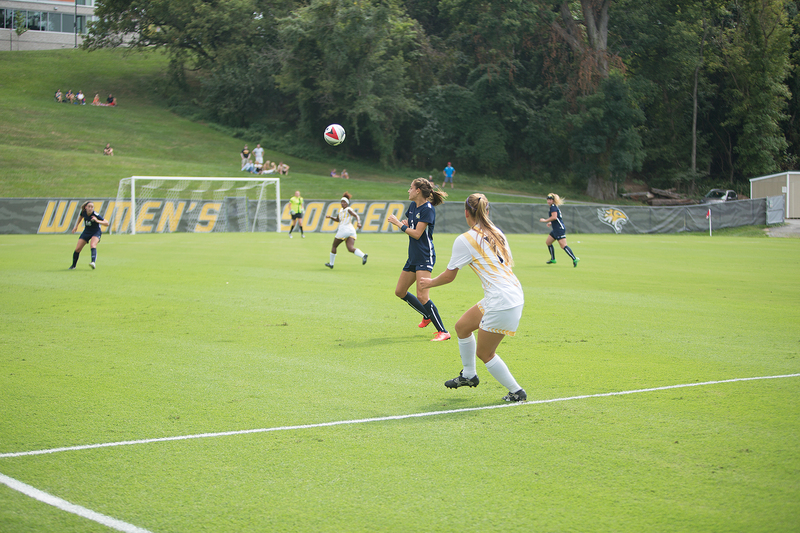 Towson pressed the action from the beginning as Green chipped a shot over the head of UNC Wilmington keeper Liisa Rahkola who managed to catch the ball but not before it crossed the line. Even though both the goalie and ball were over the line, the officials waved off the goal. Green wouldn’t have to wait long to give Towson the lead as the senior midfielder scored from a set piece routine 25 minutes in. Marshall took a free kick and passed the ball to freshman midfielder Justine Stoner, who crossed into Green who shot the ball into the back of the net. Despite being outshot 16-9 on the day, the Tigers forced the Seahawks into difficult chances that they couldn’t convert and were able to pick up the crucial win. Towson will continue its push for the CAA tournament Friday at 6 p.m. against Northeastern in Boston.